Powered mixers from Peavey will automatically EQ forany room, sanctuary, or auditorium! Intuitive mixer takes all the characteristics of the room into consideration to maximize performance in that room. The first time you set it up in a room simply plug in any quality microphone to the built-in RTA (real time analyzer) mic input to auto EQ the mixer. Mid Morph EQ allows you to cut or boost frequencies with a single dial. Most sound boards only have one mid band EQ and they are set up for musical equalization not for voice. The Mid-Morph EQ is on every mono input on these mixers . The Mid Morph EQ is optimized for voice. When turning the Mid-Morph EQ down or counter clockwise the EQ will turn down 250Hz, taking the mud and rumble out of the voice. When turning the Mid-Morph EQ up or clockwise the EQ will turn up 4000Hz, giving the voice better sibilance (you'll hear s's, t's, and words pronounced much better) with improved clarity. Either way the knob is turned the sound of the voice will improve. 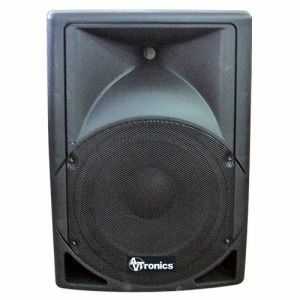 Features include 2 monitor sends for your stage monitors, nursery or overflow area as well as dual, 9-band graphic equalizers. Class D amplifier technology makes them extremely light making them perfect for portable applications. Digital effects include reverb, stereo chorus and delay. Feedback Ferret® seeks out all frequencies that cause feedback and eliminates them from your sound system.